Hearty. Warm. Filling. 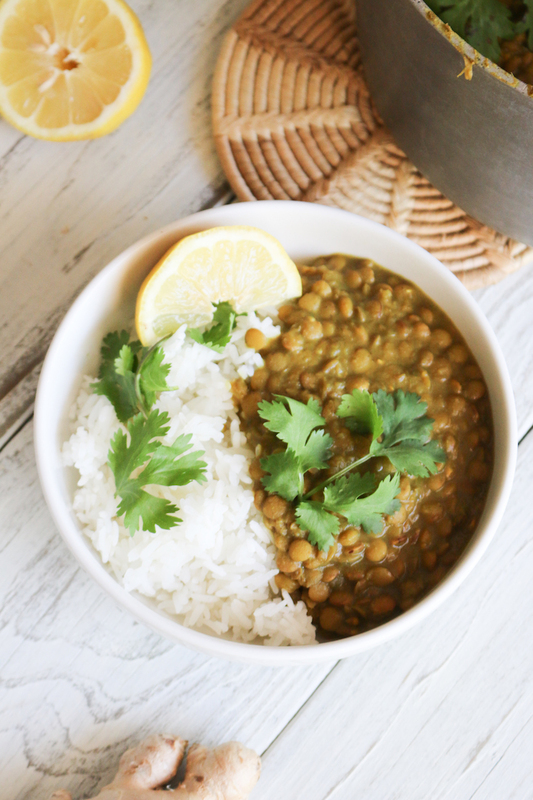 This is what comes to mind after eating this Simple 1-Pot Green Lentil Dal. It’s so easy to make, affordable, and amazing as leftovers for your weekly meal prep. I know we all go through times where our schedules are crazy, you’re bouncing from meeting, to class, to cleaning, to running around with the kids or running errands- it’s a lot. This recipe is great for those days! I’ve mentioned before that my favorite cuisine to make (and eat) is Indian. So I love to grow my collection of Indian recipes, like Vegan Saag Paneer, along with my most popular, The BEST Chana Masala Recipe. 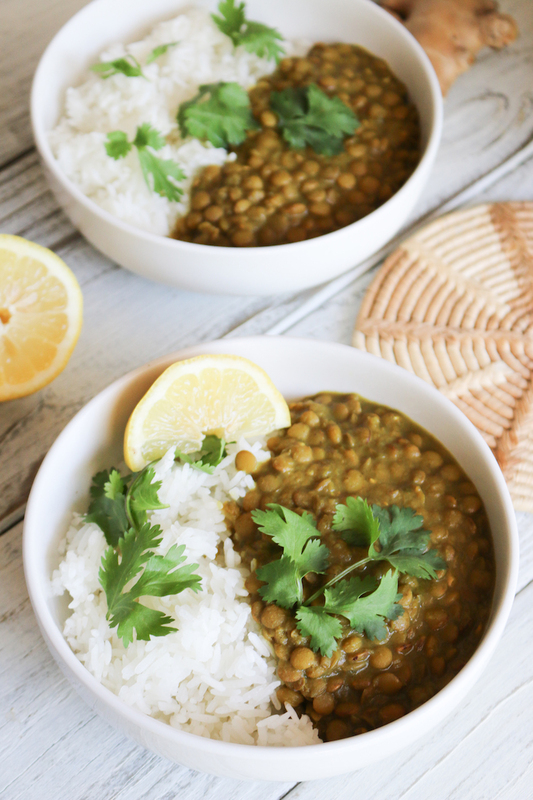 If you’ve ever eaten Indian food, chances are you’ve had dal. It’s always on all Indian restaurant menus and it couldn’t be easier to make at home. Trust me, I’m just like you and I go through days where I don’t want to cook- yes, the struggle is real. And now with a Chipotle down the street (“Chipotle’s my life”). It’s so easy to pick up take out. We all go through those times where when we get home the last thing on our to-do list is make a healthy homemade dinner, but guess what? Those are the times where we have to be purposeful about squeezing as many nutrients, antioxidants, healthy fats, proteins, and anti-inflammatory compounds as possible to keep our immune systems strong and hormones happy! Especially, if we are running around all day. Plus it’s a lot cheaper on the pocket when making your own BIG batch of food and using it throughout the week. If that’s not enough motivation to cook your meals ahead of time, then I don’t know what is! Pronounced like DOLL, also it’s spelled in many other ways including dal, dhal, daal, and dahl. 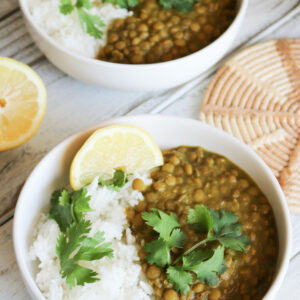 It is a broad term that refers to legumes (lentils, peas, and beans) that are cooked and spiced to perfection with curries, cumin seeds, mustard seeds, asafoetida, turmeric, and garam masala. 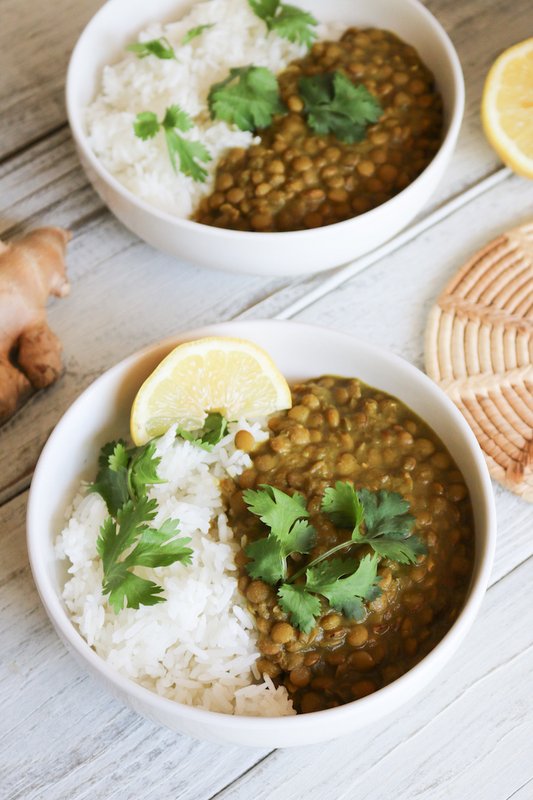 Dal is a delicious traditional dish from India and enjoyed in many other countries around the world, for good reason, it’s high in fiber, protein, and taste absolutely delicious. And guess what, there isn’t just 1 type of daal, you can make SO many different daal recipes. Just play with the different curries, spices and different types of lentils, split peas, or any other bean you would like. Dal is delicious to eat alone, I typically serve me a large bowl full to the brim and call it a day. On the chance that I have some grains, like quinoa, rice, or millet, in my pantry then I’ll scoop the dal right on top. Both ways are delicious! 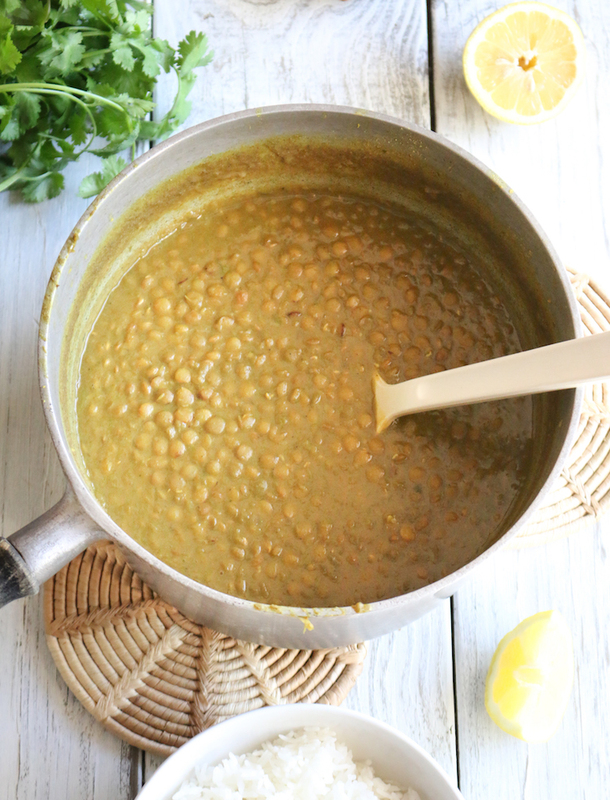 A green curry lentil dal prepared in 1 pot! Simple, healthy, and incredibly flavorful. Serve with rice, quinoa, or cauliflower rice for a hearty, wholesome, plant-based meal. Add chopped celery, curry paste and stir to coat evenly. Sauté for another 2-3 minutes. Then add coconut milk, turmeric, curry powder, salt, and pepper. Stir to combine. Bring to a simmer over medium heat. Once simmering, add the lentils, coconut aminos, and cinnomon..
Bring the mixture back to a simmer, and then reduce heat to medium-low and continue gently simmering for 15-20 minutes or until lentils are tender. Once the lentils are tender, taste and adjust flavor as needed. Serve the dal as is or over rice of choice (I love white or brown rice, but it's also delicious over cauliflower rice or quinoa). Garnish with lemon wedges and cilantro (optional). Store leftovers in the refrigerator up to 4-5 days or in the freezer for 1 month. 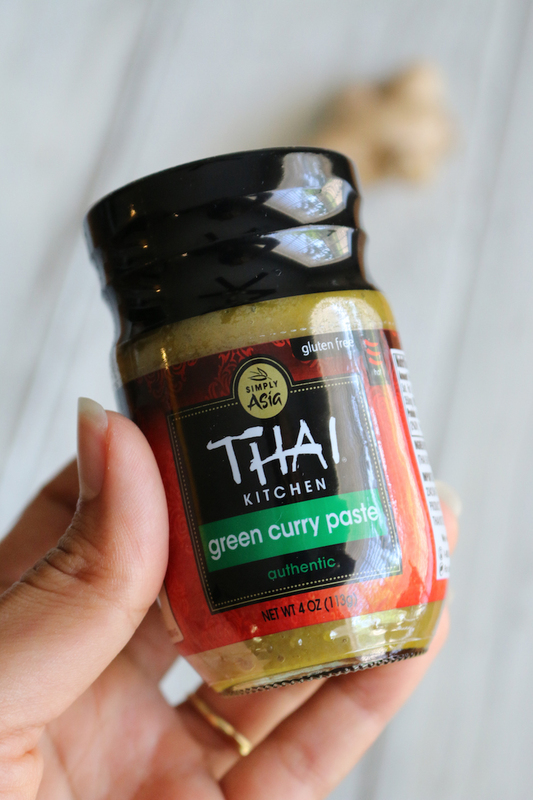 Let me know what you think when you give this recipe a try! Leave a comment and rate it. I love seeing what you all are cooking up in the kitchen, be sure to take a picture and tag me @LiveSimplyNatural on Instagram. Stay tune for more plant powered recipes!